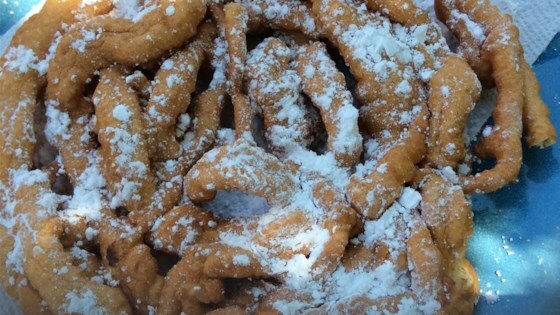 "You don't need to wait for the county fair to enjoy delicious old-fashioned funnel cakes. You just need a funnel with a 1/2-inch opening that can hold a cup of batter." See how to make the ultimate fair food at home! I liked this recipe because it wasn't incredibly sweet dough. I just halfed the batch which made 3 funnel cakes for us! Good job! I found the recipe to be great. The only thing I changed was I used a cake decorator which was faster then useing the funnel. they tasted like the real thing! i didn't have a funnel, so i used a pastry bag instead. it didn't really hold together while frying, so i made a second batch with more flour. This is soooo Good. While frying them my house filled up with the smell of our county fair; when they make funnel cakes. I recommend this to any one wanting a good funnel cake. I love this recipe. It was so easy to prepare and make everyone loved it. You can get fair style cakes at home for less than what they charge at those fairs. Amen to that!